Knitters Pride Dreamz 6" Crochet Hook Set - Wooden Hooks, Color Coded! 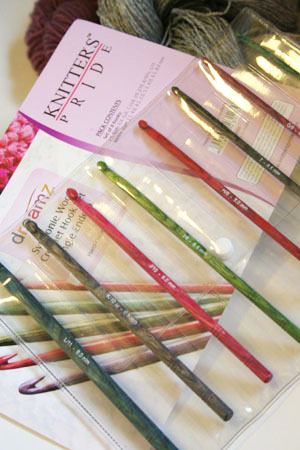 Just in - new Dreamz Interchangeable Crochet Hook - color coded for easy identification - in beautiful, lightweight symfonie wood from Knitters Pride. Fabulous set of 8 hooks - E/4, G/6, 7H/8, I/9, J/10, K/10.5, L/11 in a nifty plastic pouch for storage.